Saturday March 28th 1891 I got in four hours practice besides doing the regular work. I wrote a few lines to Lee and sent him a letter I had from Mother. The weather is cloudy and bad. Brown went home. Sunday March 29th 1891 Lee is twenty nine years old today. I got the work fixed so Agnes could get the dinner and I went to church and then on out to Otts for dinner. I walked back home about four oclock. It was a rainy gloomy evening. Fanny was not quite so well today. I played on the piano and wrote in the evening. Monday March 30th 1891 We got an earlty start at the work and done a big washing before noon. I irond some things before two oclock and as Pierce started to Mt Pleasant at that time we took the things out of his room and got the carpet put back in and churning done before supper. Will got a span of mules today. [the following text is written vertically in the right margin of the above entry] Willie come back. Tuesday March 31st 1891 It was cold windy day. I ironed the curtains and got the things all back in the west room before noon. After dinner Agnes and I gave Browns, Leonards rooms and the hall a good sweeping and cleaning. Will helped me set the incubator in the evening. We finished the ironing late in the afternoon. Lee was home to dinner. Brown came tonight. Wednesday April 1st 1891 I got the work done and dinner ready for the table and Will took me over to town. I saw Lee and he went down to Hatties to dinner. We girls went to Wood Lawn in the afternoon. Fanny was better. Will walked home from town with me. It was rainy evening. Lee come home at nine oclock. 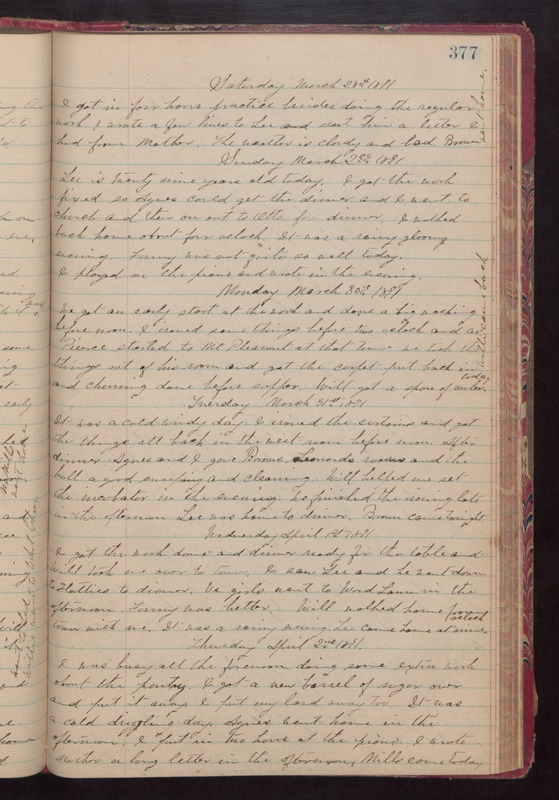 Thursday April 2nd 1891 I was busy all the forenoon doing some extra work about the pantry. I got a new barrel of sugar over and put it away. I put my lard away too. It was a cold drizzling day. Agnes went home in the afternoon. I put in two hours at the piano. I wrote Mother a long letter in the afternoon. Mills came today.